Have a Straight Out Of the Camera (SOOC) image you want to show off, play along with us. Use Mr. Linky to sign-on. What a very lovely shadow shot! it looks delicious. bet it smells that way too. Nice rose but I especially like the water droplets! Nice, Jan!! a beautiful rose...and i too love the water droplets! Beautiful Rose!!!! I don't have any luck with roses growing here! Thanks for sharing! Have a great day! 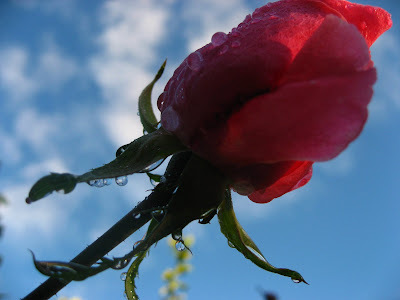 The blue sky behind the lovely red rose really got to me. Nice. Thanks for this photo meme. I have my first SOOC post up, too. I love the shot silhouetted against the sky. Very pretty.